Sign up for free and just shop with Farnell element14 as normal. Our average member earns over £300 cashback a year. Cashback excludes purchases with Raspberry Pi. Farnell element14 cashback can be earned simply by clicking through to the merchant and shopping as normal. Farnell element14 Cashback is available through TopCashback on genuine, tracked transactions completed immediately and wholly online. Browse a huge range of technology supplies, solutions and services and cut the cost when you buy online with our Farnell discount code and cashback deals. Whether your purchases are for electronic system design, maintenance or repair, Farnell element14 offer free delivery (next working day) when you spend over £20. Search more than 650,000 Farnell electronics products, including software and testing kit, which they add to every day. Not only will you find complete design solutions, but you can also make use of free technical support and an online engineering community. Save time by using their buying tools, download the app to shop on the go or register for an account. You will be able to save on products from leading industry brands when you sign up to TopCashback by filling in the form further down this page and making use of our Farnell voucher code and cashback deals. 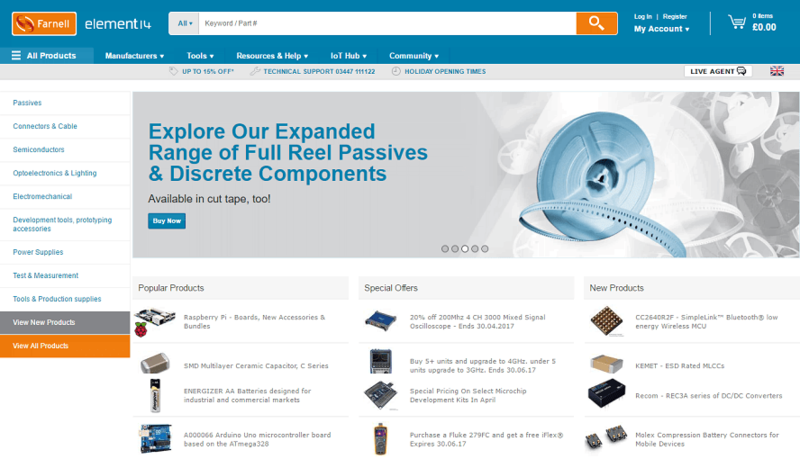 Browse categories such as passives, connectors & cables, semiconductors, electromechanical, development tools & prototyping accessories, test & measurement and tools & production supplies to find exactly what you are looking for. Search for passive Farnell components, Siemens circuit breakers, Phoenix Contact terminal blocks and Analog Devices signal and conversion products. Farnell element14 also stock Panasonic Electric Works digital timers, Texas Instruments embedded development kits and Fluke electrical testing equipment, while they can also supply you with a Raspberry Pi desktop, HP consumables for computers and chemicals and adhesives for your business by the likes of Loctite and 3M. If you have a parts list or bill or materials, you can take advantage of their range of buying tools to save time. You can upload your entire list or bill thanks to their automated Parts List Upload (BoM) tool using Farnell element14 or manufacturer parts numbers, as well as product descriptions or keywords. As well as being able to find your parts quickly, it features real-time uploading and item matching. Quick Paste allows you to copy a list of parts numbers and quantities into a form, which will enable you to add them to your shopping basket, while if you just need a few parts, Quick Buy allows you to enter the Farnell element14 parts numbers and amounts, and their system will find them and add them to your basket. You can also make use of interactive catalogues, eInvoicing and browser search tools, while you can request a quote. Download the free Farnell element14 app for your iOS or Android device from iTunes or Google Play and you will be able to search for and buy technology products and solutions on the go. Access all the product information you could need, including real-time pricing and availability, while you can switch between your desktop, tablet and smartphone and keep items in your cart so you can buy at any time. Complete orders or sign in to check your order status, wherever you are, watch product videos on your phone and call them directly from the site if you need any help. No matter what you choose to purchase, Farnell element14 offer free next working day delivery on UK online orders over £20. You will need to place your order by 8pm to receive your items the next working day, while this is free for trade account holders, no matter how much money is spent. Next day delivery cannot be guaranteed to all parts of the country. If you need it even quicker, the UPS express delivery service will get it to you the next morning. You can choose from their before 9am, 10.30am or noon weekday services, while you can also arrange for your order to be delivered before noon on a Saturday. A same day delivery service is also available, but you will need to call Farnell element14 for prices. If whatever you buy does not meet your expectations, you can take advantage of their 21-day returns policy (exclusions apply). However, before you send anything back, you will need to contact Farnell element14 to obtain an RMA (return materials authorisation) number. Once an RMA has been obtained, you should return your goods as instructed, quoting the RMA number, your account number and order number on the outside of the package. You will have to cover the cost of returning the item, while it will need to be sent back undamaged and in its original packaging. Any products returned after 21 days as unwanted or incorrectly ordered may be accepted at the company's discretion, although they will be subject to a minimum restocking fee of 20% of the invoice value or £10, whichever is the greater. Farnell element14 are focused on making it easier to get the products you need when you need them. They have fast access to the latest technology, personal service and easy to use. All whilst earning great cashback when you shop. Farnell element14 are distributors of technology products, services and solutions for electronic system design, maintenance and repair. They are a high-service distributor of technology products, services and solutions for electronic system design, maintenance and repair. With more than 650,000 products, services, software and solutions and hundreds of new products added online every day. Their products include batteries and chargers, cables and connectors, as well as passive components, semiconductors and transformers. Shop for LED lighting, wireless products, medical equipment, alternative energy, sensing and robotics. Farnell element14 also provide engineering design resources, calibration services, facilities and operations support, as well as purchasing and procurement support. You will also find design resources, including development tools, lab supplies and PCB services. Took a look today, buy and earn cashback on these great products with great deals.